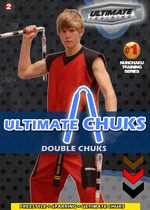 Ultimate Chuks is a complete curriculum based off the dynamics of freestyle nunchakus, combined with the traditional understanding of Okinawan nunchaku. You will begin with the basic single techniques and by the end of this series you will have a complete, unstoppable, intense understanding of how to use this ancient weapon. 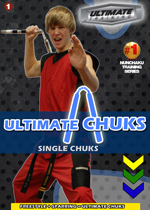 By purchasing the Ultimate Chuks Course, you will receive the manual + be an officially enrolled student. This means that you have the ability to take rank exams if you would like to. The manual provides information on the background of the style, the process for taking rank exams, the rank requirements, and also frequently asked questions. You will receive 3 packed training DVDs with the program! Distance Training is a new way to take your training to the next level! With our Distance Training Programs you have the ability to earn official rank and even instructor certification. We have made it as simple as possible. You get to train whenever and wherever! the courses are self paced- train extra hard and advance quickly, or take your time. Everything is simple and cost effective. We have a very simple process for testing students, which uses a video rank exam format; with detailed testing standards and an instructor feedback loop. Click on the banner below to learn about the process. How long do I have to wait between rank advancements? The first two levels of each of the DT programs have no minimum wait. We believe that those who work hard deserve to advance quickly instead of waiting around for no reason. Likewise you have no limit on how long between; you can take as long as you need before your exam. After the first two levels of rank the minimum wait varies; from a minimum wait of one month and above. This allows us to maintain integrity in the style. Do you have to pay a fee for each rank exam? Yes. Rank exams are $60 each for yellow – green chevron, and $70 each for blue – red chevron. First of all, the fee covers the time and energy that your instructor takes out working with you and grading your exam. Your instructor will take out a good chunk of time to study your exam, grade it, make detailed notes, and work back and forth with you in communication. The fee also covers the actual certificate of rank, and the mailing of this certificate and chevron patch to your address. The more advanced levels require more intricate study, review, and time spent on communication. What if I have questions that the training videos do not answer? You have the ability to correspond with the Master Curriculum Instructor, Michael Hodge, at any time via e-mail or phone. You can also sign up for Private Lessons with the Master a program that allows you to work one-on-one with the Master Instructor through a web cam or other utility; this will allow for the best instruction and advisement. Contact us for more details. Can I seriously learn from a video? Ultimate Training™ by Hodgyma has developed a revolutionary new video curriculum format which has proven results. Students learn as well, and in many cases better with our instructional DVDs. Of course, you have the ability to pause, rewind, and play any lesson chapter whenever you want – try doing that with an instructor at a local martial arts school. Why should I choose Distance Training instead of a local martial arts school? 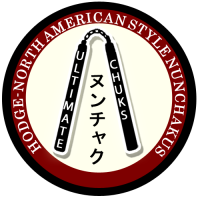 The Ultimate Bo Distance Training course is the only way in the world to earn a true black belt rank in the weapon of BO. 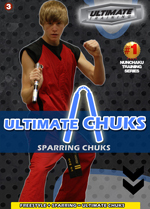 The Ultimate Chuks Distance Training course is the only way to earn a true black belt rank in the martial arts style – Ultimate Chuks – a uniquely recognized style mixing freestyle and sparring nunchakus. 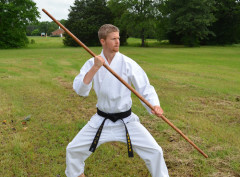 The Ultimate Karate Distance Training course is the only way to earn a true black belt in the unique mixture style of mudokwan tae kwon do and shotokan karate. You will literally save thousands of dollars in tuition and other fees. Great course. Just completed yellow chevron. Thanks for the great training experience. Loving it. Thanks Sensei. Hi everybody !I want to share my chucks home training experience.First I want to say that distance training fits me fine as I feel very free to practice whent I have time !Of course It's very important to practise regularly, 1/2 hour 4 days a week cant be enough.Chucks can be physically challenging but for the learning and the warm up it is possible to practise "tai-chi" like movements.I started this course in 2014 and I am preparing myself to the blue chevron test. I take my time, I really found the way to improve myself.Ahh of course, I confess that don't understand a lot of what Sensei says because I'm French and Texas accent is hell but... just have to watch, watch again and repeat the same movements.